Have you recently encountered a Shiba Inu with shiny eyes, glossy fur, and an almost unreal perfection? Then perhaps you’ve met the current internet meme known as doge. As I have previously written about Grumpy Cat, a feline of great online notoriety, I thought it only fair to showcase a canine equivalent/ rival. The doge meme is based on the misspelling of the word ‘dog’ which appeared in an online puppet show back in 2005 and was spread through sharing on both Reddit and Tumblr. In August 2013, the doge meme was used by 4chan members to raid Reddit; however, “unlike previous clashes between the users of 4chan and Reddit, the sudden influx of Doge images was reportedly met by little opposition from Reddit’s userbase, reflecting the growing popularity of the character outside of Tumblr” (Mister J, knowyourmeme). “Today, I believe every popular internet meme is invented and propagated by a secret elite vanguard of advertising creatives honing their skills at manipulating the internet in order to more quickly bring about a future where all human communication, from the most mundane Tweet to the deepest artistic gesture, is in the service of Brand Awareness” (Chen, Gawker). 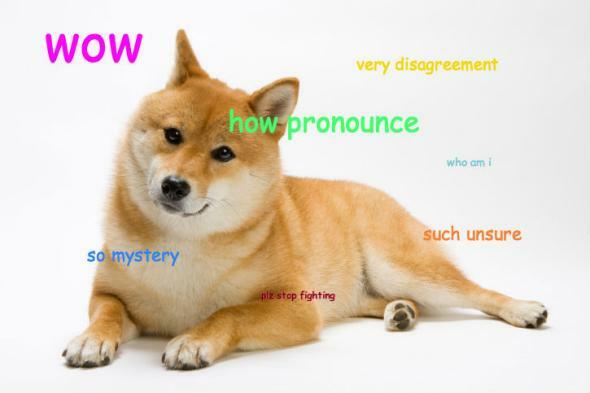 “Doge is a meme which, at its most basic, consists of a picture of an adorable shiba inu dog photoshopped onto a scene, then surrounded by a cloud of multi-colored words and phrases. The words are supposed to be the dog’s internal monologue, and the dog is astonished, it seems, by the very fact that it is having an internal monologue. (Dogs aren’t supposed to have monologues, see.) The text consists of short, ungrammatical exclamations of surprise about the situation the dog is in and of which it finds itself suddenly, unnaturally aware. Like any good meme, the text adheres to an easy-to-follow formula, which starts with “Wow,” then continues something like “Such X,” and “Many X,” “So X,” where X is words related to the background image” (Chen, Gawker). Articles are now emerging in online news sources like Slate.com, querying how the word ‘doge’ is even pronounced (see the full article here). Legitimate concerns exist that the word doge will enter the common parlance, thus motivating Slate writer Forrest Wickman to write “as with GIF, I’m inclined to accept both the hard G (like dog) and the soft G [in the pronunciation of doge] because both are in common use and can be justified with reasonable explanations” (Wickman, Slate). If you ever have any doubt that the internet has the power to change the way we speak and think, recall that the word of the year for 2013 is ‘selfie’, a common online term, according to the Oxford Dictionary (Stewart, CBC News). I believe that the word doge could end up in common usage, and possibly even in a dictionary that doesn’t cater exclusively to slang terminology. Certainly, David Foster Wallace seems to agree with this possibility. Edit: The doge meme may be dead after U.S. Republicans tweeted images of our beloved Shiba Inu in a misguided attempt to please younger audiences. Despite that, I continue to follow the Doge’s Adventures.